Best Pocket Radar Ball Coach Review – Better Than Alternatives? As a baseball coach you will need proper info to help your team get better, and for that you can use the Pocket Radar Ball Coach to help. This is a tiny gadget that’s even smaller than a smartphone, but it sure offers huge benefits for every team who knows how to use it properly. Could this tiny gadget be a better product than all the expensive alternatives? Can this radar increase the confidence and performance from your player? Find out in this top notch Pocket Radar review which pulls from experience from parents and coaches who use it. At first glance, it looks like an old-fashioned cell phone that fits well in your hand. It’s just 4.7 inches long and 2.3 inches wide, while it’s only 0.8 inches thick. You can easily hold it in your hand, or put it in a shirt or trousers pocket. It doesn’t weigh all that much either. It’s powered by 2 AAA batteries, and all in all they only weigh 4.5 ounces even with the batteries inside. What Does Pocket Radar Ball Coach Actually Do? What it does is to basically function like a tiny radar gun. It measures how quickly a ball is travelling. It can detect the speed of a ball ranging from 25 mph to 130 mph (40 to 209 kph). Its accuracy is quite good, as it’ll be within a ballpark figure of within 1 mph of the correct speed. You don’t have to be all that close to the object to detect its speed. For baseball and softball, you can stay within 120 feet and you can detect the speed of the ball or puck. For bigger balls like volleyballs, the range increases to 150 feet. Want this Pocket Radar with Free shipping? This gadget just has the screen which will display the speed in mph or kph. You have a large blue button below the display to turn the device on. To the left of the large blue button, there’s also the mode and recall button to let you adjust the settings. With this you can pick the hands-free Constant-On mode, so you can concentrate in coaching. You can also use the automatic triggering feature by just holding the button down and then releasing the button when you get the speed on the display. The Pocket Radar automatically tracks the object you’re trying to measure. It has enough memory to save the last 25 speed readings. It also has an automatic shutoff feature to help you conserve the battery power. The radar automatically powers down after 30 seconds when you manually trigger it. In Constant-On mode, it will shut down after 5 minutes of not getting any speed readings. It uses a couple of AAA alkaline batteries, and that’s part of your purchase. So you can use it right out of the box, with the batteries offering enough power for an hour’s worth of Constant-On mode. If you trigger this manually, you can get at least 2,000 readings before you’ll need to replace the batteries. You may want to supplant these stock batteries with rechargeable AAA NiMH batteries, which you will need to buy yourself. That set of batteries will give you 2 hours for Constant-On and more than 4,000 manual triggers. Buy this, and you also get a wrist strap and a belt holster case, along with the batteries and a quick start guide. It should last for a long while unless you don’t take care of it, as it has a 2-year warranty. Right away you can probably understand the appeal of the Ball Coach Pocket Radar over a standard radar gun. It’s not just about the price either. This gadget is small and lightweight, so it’s extremely portable. You can lug it around in your pocket, belt case, or wrist strap and you may not even notice that you’re carrying it. Plenty of Pocket Radar Ball Coach reviews laud its tiny size. What’s more, it’s a great alternative to bulky radar guns. You can use this without even having to use your hands, and as a coach it helps a lot during practice. More often than not you want your hands free to help train your players and carry equipment, so not having a large radar gun is a great convenience. It’s extremely easy to use, and its simplicity keeps you from getting distracted. There’s really nothing much to figure out here, so you can concentrate on actually training your baseball players instead. Of course, this isn’t just for baseball and softball either. You can also use this to check the power of your volleyball and hockey players, based on how fast they can make the volleyball or hockey puck move. It also doesn’t need a lot of battery power either. Use this manually, and it can last for several weeks. It’s also great that you only need 2 batteries as well, unlike bigger radar guns that require up to 6 AA batteries. Despite its size and simplicity, it’s actually quite accurate especially if you’re directly in lien of the ball flight. So stand behind the pitcher or behind the batter, and then you can gauge the speed of the baseball accurately. This works for testing speeds of pitching machines too. At an angle it may not provide you with an accurate reading, but you can always just mentally add a few mph units to the reading. What’s important is that it will give you consistent readings, so even at an angle you’ll know when the next pitch is faster or slower than the previous pitch. The main problem here for some is that at an angle from the ball the readings won’t be as true. Also, it can get annoying having to replace the batteries constantly when you’re in Constant-On mode. Finally the range of detection won’t really help you much if you’re a parent watching your kids play baseball. It doesn’t quite have the range of traditional radar guns, which can track objects from several hundreds of feet away. Can Be Used For Training and Monitoring Fatigue? 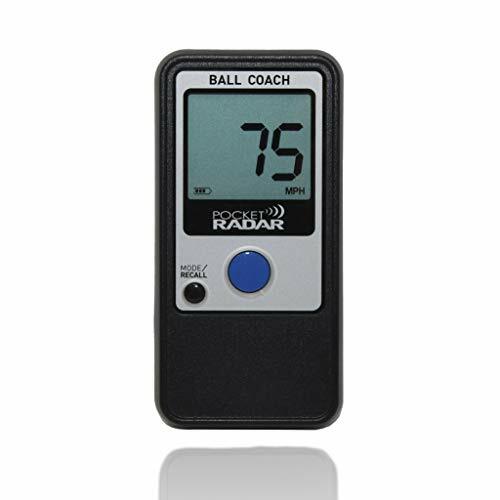 Our Pocket Radar Ball Coach review finds this gadget as a worthy tool for any coach and parent who want to help train their baseball players to get better. It’s easy to use and quite accurate, and it will keep you from having to guess whether or not a pitch is faster or slower. With this device, you and your players will know and there won’t be any debate about the facts! Use it at the ballpark or the backyard in your batting cage.